Today I am linking up to the Roomspiration link party and I am sharing with you my Entryway. 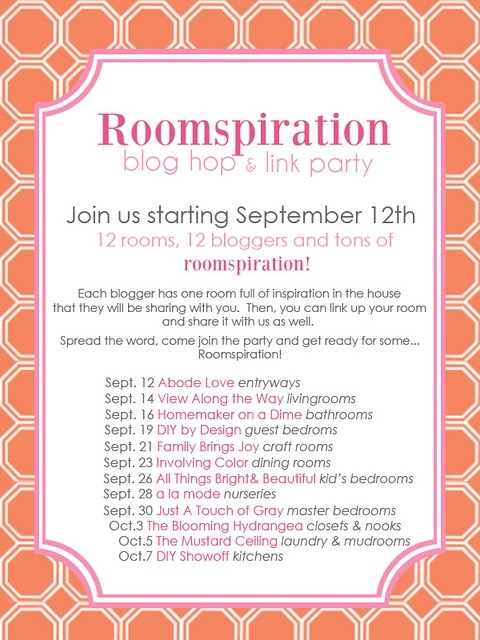 I am very excited about being a part of this link event and will be joining in on the fun throughout the month. Look forward to seeing your links too! Me and Abbie welcome you to our home. Entryways are the first impression to your home and design style. My entryway is pretty simple but my favorite part starts on the outside with a red door and a cozy porch. Our wrap around porch is one of the reasons I love this house and it allows a great space for plants and reading books. Inside I have kept it pretty simple as my Foyer opens up to my dining room and leads into our living room. One of the features we liked best when we purchased our home was that the staircase was in the foyer but off to the side. A lot of new homes in this area have the staircase literally 2 feet in front of you when you step through the door. This layout works much better for us. Our rug pulls the reds and greens from the living room and the purple from the dining room all together. Hope you enjoyed the mini tour. 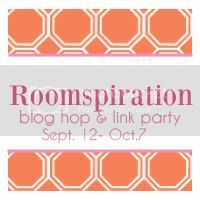 With all the inspiration from this link party I’ll be ready to change things soon! Be sure to check out Abode Love today to join in on the fun and see the other Entryways. Thanks for your sweet note today! I love your entry, especially that charming exterior. The wrap-around porch + red door combo is SO beautiful!